I am a brownie hound. The richer, thicker, and fudgier, the better. I’m also a brownie purist and strongly believe that a brownie should never be cake-like; otherwise, it would be chocolate cake, and it is not. I have been in constant search of the perfect brownie recipe ever since I graduated from boxed mixes (it’s funny how differently they taste now that I’ve had good, homemade ones) and nowhere did I find one that was as decadent, luscious, dense, and dark as I wanted. After many, many transformations, I finally evolved an old recipe into something approaching the perfect brownie. 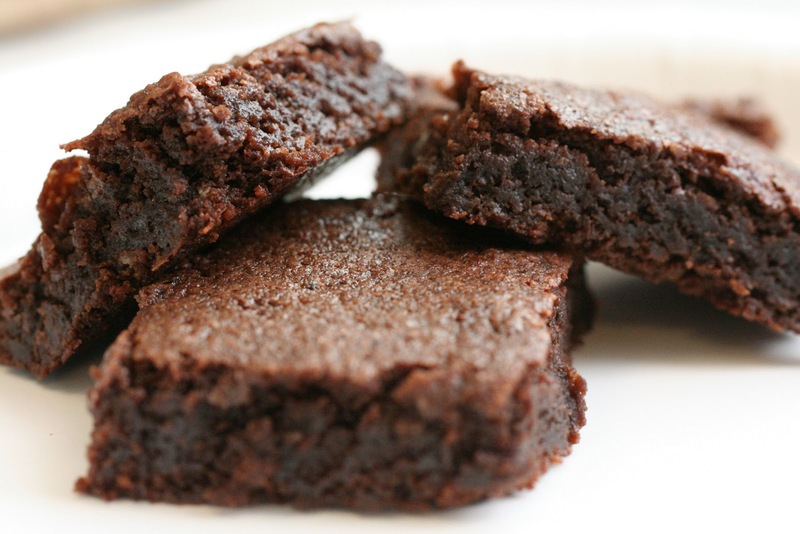 This recipe makes a thick, unbearably rich, and luxuriously fudgy brownie. For the dark-chocolate lover and all my fellows who scoff at “cake-like” brownie recipes, this brownie is the one for you. Preheat your oven to 350° F. Grease a 9 x 13 inch baking pan. In a small bowl, combine your flour and salt. When the chocolate and butter are melted, remove from heat, and stir in your sugar. Allow this to cool slightly (3 minutes, or until just slightly warm). Stir in your flour and salt. Bake in oven 20 to 25 minutes (I cheat here and under-bake. I take them out when an inserted toothpick still has some brownie clinging to it). To make your brownies a little denser (and prevent over-cooking while in the pan), you can stick them in the fridge and lay a ziplock with ice in it over the top. This is sort of the ultimate brownie rule: never, ever over-mix your batter. I would recommend hand mixing this entire thing with a wooden spoon (not an electric mixer). The more you mix the batter, the fluffier the end product becomes. When you’re looking to try a new brownie recipe, always look to see if it calls for chocolate or cocoa powder. Cocoa powder yields a drier and more cake-like brownie. Using unsweetened chocolate (if the recipe calls for semi-sweet or bittersweet) may make your brownie too dry and crumbly. Sugar holds things together and keeps pastries moist. This recipe is incredibly easy to make, consistently delicious, and simple. It yields an intensely dark, rich fudge brownie (and it tastes amazing as batter, too). This is a classic brownie and works as a great base with room for improvisation (like adding nuts, caramel, toffee bits, ginger, raspberries, espresso, etc.). It uses the classic brownie “cheat”: under-baking, but who cares when it tastes so smooth and luscious? The search for the perfect fudge brownie continues, but so far, I haven’t found anything to top this one.